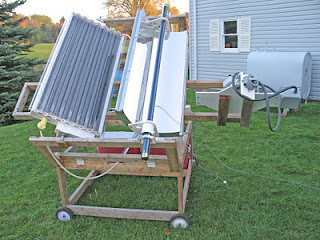 If you have ever puzzled over whether it would be better to make a regular flat plate collector or to make a tracked parabolic trough concentrating collector for your solar water or space heating project, George has done some really interesting side by side test comparisons of the two. The test setup George built allows two collectors to be mounted side by side. Either or both collectors can be setup to track the sun through the day. Each collector heats an identical insulated water reservoir, and the figure of merit is the water reservoir temperature over the day.